Congratulations to Rostand and Michael on passing their 3rd kyu (green belt) grading and to Nick for passing his 4th kyu (orange belt) grading. Congratulations to Tony on passing his 5th kyu grading. Congratulations to Helen on passing her 5th kyu grading. Congratulations to Adam on passing his 4th kyu grading. Congratulations to Bob on passing his 5th kyu grading. The Kai Shin Kai (our parent organisation) are official supporters of the This Girl Can campaign a national campaign developed by Sport England and a wide range of partnership organisations. It's a celebration of active women up and down the country who are doing their thing no matter how well they do it, how they look or even how red their face gets. Congratulations to Nick on passing his 5th kyu grading. Thank you to all that helped out with the aikido demonstration at the Naunton village fete. I have had quite a few favourable comments from local residents. Congratulations to Louise, Rostand, Rob, Pablo & Michael on passing their 4th kyu (orange belt) grading. Congratulations to David on passing his 1st kyu (brown belt) grading at this year's KSK national gradings. Congratulations to Rostand and Adam on passing their 5th kyu grading. Congratulations to Louise, Elisabetta, Paul(Pablo) and Rob on passing their 5th kyu grading. 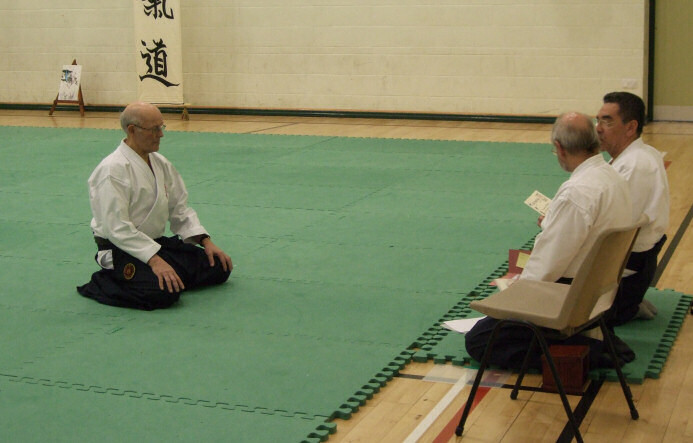 Graham on passing his nidan (2nd dan black belt). 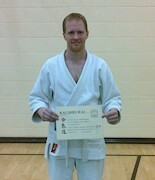 Congratulations to Graham on achieving his 1st dan (shodan).